To all our valued users and prospective users we say thank you for your patronage and also thank you for being patience with us. We feel obilge to inform you that Mobile Network Operators in Nigeria requires that All Application to Phone Messaging (BulkSMS) Should have their Sender IDs registered and Approved by the operators before they would allow delivery of SMS using that sender ID to their network subscriber, we went ahead and registered all Sender IDs that have been used on Our Platform and that of all our resellers since inception. This means before you send a message, you will need to pre-register new sender Ids that you have not used before to ensure delivery of your SMS across all Telecom pproviders. Send the sender id you want to used for the message two days(48 hours) before sending the messages so we can send it to our operators for registration. you can send it to our support email (support@cloudsms.com.ng) or phone number via sms/whastapp (08059664130). 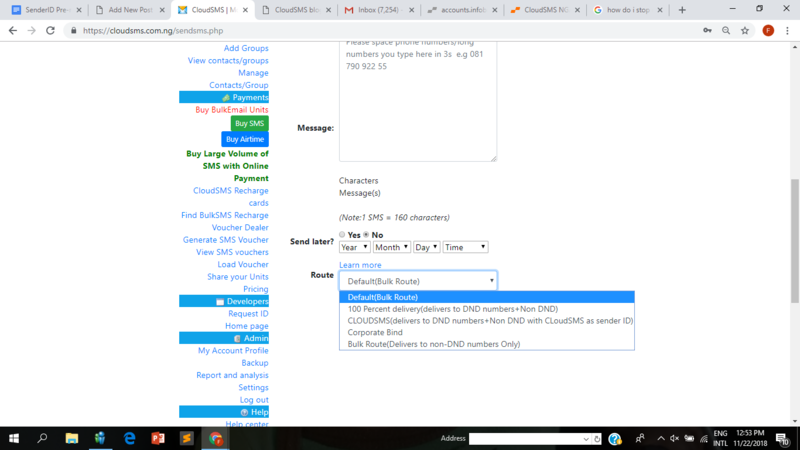 If your Sender ID has not been pre,registered and you need to send BULKSMS Urgently, You can send using any of the below Sender ID that we have Sent to the operators for approval and has been approved or you click on 100percent delivery (Delivers to DND + NON DND NUMBERSS) in the Route option showing in the diagram below. To ensure delivery of your messages please click here to check this list of banned words by Telecom operators in Nigeria, and avoid using those words in your message. Below are the list of general Sender IDs that you can use pending registration of your sender ID, choose the one that is most suitable to the message you intend to send.